Many of you have been inquiring about the 2016-2017 indoor flying season schedule. While dates had been tentatively set, and I was hoping to give you all good news, things have taken a turn. Central Michigan University has new people in charge of the facility management and scheduling. Unfortunately they feel, that while the dates we scheduled were dates the facility was not in use and we always had an agreement that should it be needed at the last minute for an activity we would modify our schedule, that they can no longer provide us with the discounted rate. The rate they are now asking for is beyond what we as a club can afford. The new administration is also asking for their normal rate plus equipment fees for us to hold our annual Toys for Tots event. 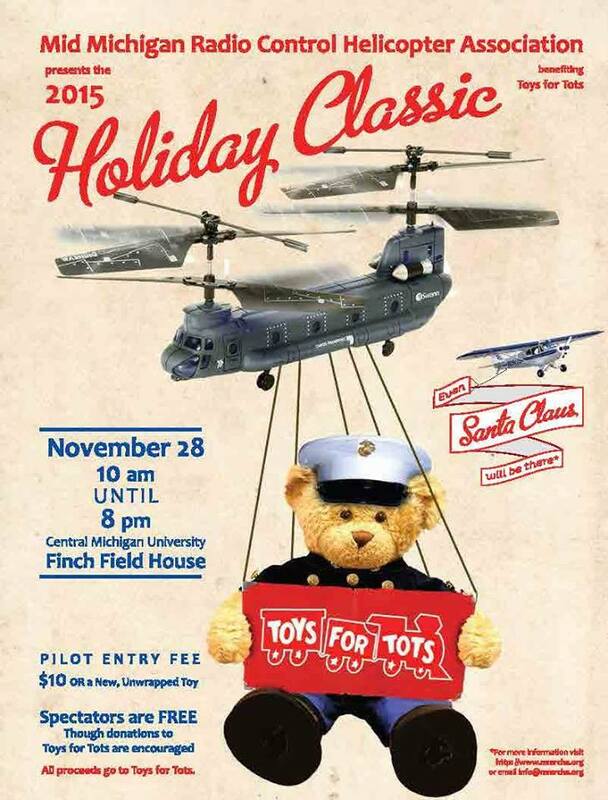 With the University's new policies MMRCHA will not be able to host the Annual Toys for Tots event, nor our normal indoor season. We have searched for other appropriate venues in the area but have come up short. MMRCHA will be partnering with West Michigan Park Flyers to host the Foam in the Dome on December 17 from 9:00 am until 9:00 p.m. The address for that event is 12733 US131-Schoolcraft, MI 49087. More information about can be found here Foam in the Dome. Mid Michigan Radio Control Helicopter Association (MMRCHA) was founded in 2010, by a small but dedicated group of modelers. We promote modeling of all kinds with most members having begun as fixed wing pilots. Many of us fly radio controlled airplanes as well as enjoying model helicopters. We are an Academy of Model Aeronautics sanctioned club and host events throughout the year. Check out our Photos page for pictures of various events.